the amount of displacement of the fringes, if there were any. The last mirror is mounted on a slide; so these two paths may be made equal to the necessary degree of accuracy— something of the order of one fifty-thousandth of an inch. Fig. 108 represents the actual apparatus. The stone and the circular disc of wood sup-. porting the stone in the tank filled with mercury are readily recognized; also the dividing surface and the various mirrors. 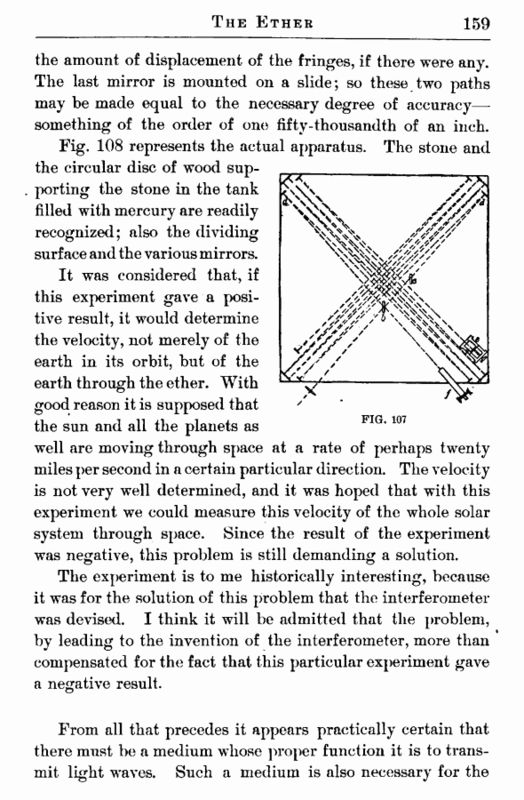 It was considered that, if this experiment gave a positive result, it would determine the velocity, not merely of the earth in its orbit, but of the earth through the ether. With good reason it is supposed that the sun and all the planets as well are moving through space at a rate of perhaps twenty miles per second in a certain particular direction. The velocity is not very well determined, and it was hoped that with this experiment we could measure this velocity of the whole solar system through space. Since the result of the experiment was negative, this problem is still demanding a solution. The experiment is to me historically interesting, because it was for the solution of this problem that the interferometer was devised. 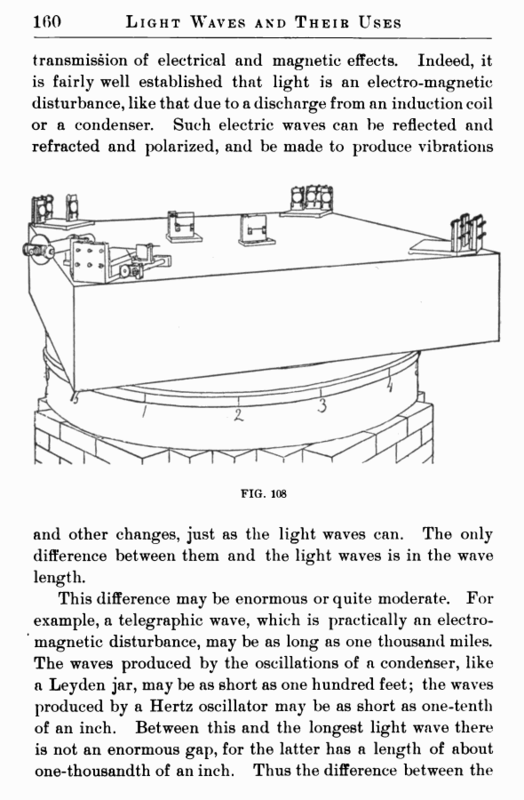 I think it will be admitted that the problem, by leading to the invention of the interferometer, more than compensated for the fact that this particular experiment gave a negative result. and other changes, just as the light waves can. The only difference between them and the light waves is in the wave length.